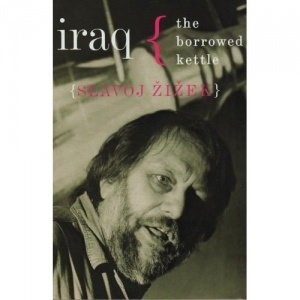 That same inconsistency, Zizek argues, characterized the justification of the attack on Iraq, whereby a link between Saddam’s regime and al-Qaeda was transformed into the threat posed by the regime to the region, which was then further transformed into the threat posed to everyone (but the US and Britain especially) by weapons of mass destruction. When no significant weapons were found, we were treated to the same bizarre logic: OK, the two labs we found don’t really prove anything, but even if there are no WMD in Iraq, there are other good reasons to topple a tyrant like Saddam . . .
Iraq: The Borrowed Kettle analyzes the background that such inconsistent argumentation conceals and, simultaneously, cannot help but highlight: what were the actual ideological and political stakes of the attack on Iraq? In classic Zizekian style, it spares nothing and nobody, neither pathetically impotent pacifism nor hypocritical sympathy with the suffering of the Iraqi people. This page was last edited on 14 June 2007, at 17:04.